I probably should have started with topic as the opener. If you're like most people, you have a wedding budget to work with. We gave ourselves $5,000.00 to make it all happen. $5,000.00 is a lot, but not. There are probably a million and one wedding budget guides out there to use. I looked a few over and saved a couple to my wedding Pinterest board to reference. But most didn't apply to us. So I took some basic information that the guidelines had and created my own. Expenses that didn't apply to us: venue fees, officiant fees, florist fees, catering fees, the rehearsal dinner, photographer and DJ fees. Sounds like we got married at the justice of the peace right? I assure you that wasn't the case, let me break it down for you. Our ceremony site decorated with pieces of the tree that fell down onto the house. I stood pieces on end and hung a small flower back drop off of a few large branches that had pinecones on them. Venue - After we found out that the venue we wanted was sold and we tried contacting them to make arrangements without success. We decided to host our wedding in the backyard of some family property that we own. It is modest but had everything we needed. 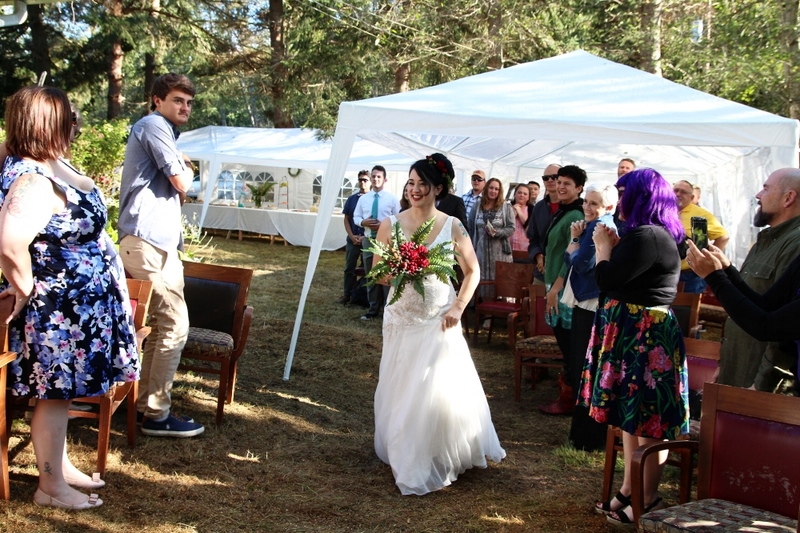 The house was small and we had to plan to have the ceremony and reception outdoors. We had both on site. Which made it easy for our guests, they only had to park once. We purchased two large event tents on sale for $200.00. They were fantastic! White with windows built into the sides, fancy enough for us. We used some other pop up tents that I have purchased over the years for outdoor shows too. Other things we purchased for our venue, blankets for our guests (we live in the PNW where it can rain at any time - and it did the day before), lighting, decor items - like vases, large tablecloths, materials to build long tables and event insurance. Our very good friend Chris and our eldest son Calvin setting up the tents and the long tables. The tables all set up with food for the guests to have right away. John waiting at the beginning of the ceremony. Ceremony - John's best friend came up from California to be our officiant. It made it special for us to have someone close do us that honor. Although he was nervous, he was fantastic. He announced us "Carbon based lifeforms". We had our children give us away to each other and that was our only wedding party. We purchased wedding clothes for the kids and ourselves. I did my own hair and make up as did our daughters. And as you can guess, I did my own kanzashi and keepsake wedding bouquet. I'll do a post dedicated to just that in the very near future. We asked my now mother in law to be our photographer. No one could've done a better job for us that she did. Miscellaneous fees include, the wedding programs that we had the content printed and our daughters assembled, wedding favors that we produced ourselves, wedding rings handmade by Foamy Wader, John's attire and my wedding dress that I bought in the off season. All said and done our ceremony cost us approximately - $1,000.00. We did have some hurdles with the venue. About a month and half before the wedding, a large tree fell on the house. It caused a couple thousand dollars worth of damage AND since our budget was tight (we also had a surprise $3,000.00 car repair bill just before the tree fell on the house and we depleted our wedding account to pay for that) we couldn't afford to have the tree removal company actually remove the tree and the branches from the property after they cut the tree down. We had to do that ourselves, three days before the wedding. We also had to repair a broken pipe in the house that was unrelated to the tree damage. Jina - my eldest daughter. Is not only a brainy boss babe - but an excellent cook too. I'm not sure how I got so lucky with this kid. Reception - My eldest daughter and I personally prepared all of the food. Three of our kids did help with rolling some of the 700 pieces of lumpia that was made for the wedding. I asked a long time friend to actually cook the lumpia on site. Our entire family (that includes some very good friends that are like family) helped with setting up the reception area and bringing the food out onto the tables. From the beginning I wanted there to be food everywhere for guests to eat since everyone was traveling to attend the wedding. My nieces (who are adults) offered to bake our wedding cake. To this day, I still cannot believe what a fantastic job they did! It was absolutely incredible and that deserves it's own post. We provided beer, wine, hard alcohol, soft drinks, juices and water. We filled our little boat to the brim with drinks and ice for our guests to help themselves. My sister and nieces bringing in the beautiful cake they made. $5,000.00 - maybe a smidgen above that. I didn't keep a solid track on our clothing expenses and we did have some tools and repair costs that went in one ear and out the other. I am personally still in shock almost a month later that we ALL made everything happen - so perfectly imperfect. I'll dedicate posts to my kanzashi, our beautiful wedding cake and a couple other details that made the difference at our wedding.